1. A 0.1-kg ball, attached to the end of a horizontal cord, is revolved in a circle of radius 50 cm and ball’s angular speed is 4 rad s-1. What is the magnitude of the centripetal force? 2. A ball is revolving uniformly in a horizontal circle. 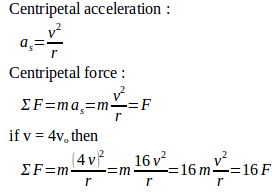 If the speed changed to four times the initial value, what is the magnitude of centripetal force…..
3. A banked curve of radius R is designed so that a car traveling at speed 12 ms–1 can negotiate the turn safely. The coefficient of static friction between car and road = 0.4. 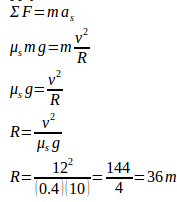 What is radius R. Acceleration due to gravity (g) = 10 ms–2.